Every day, students enter the doors of their schools feeling welcomed and supported and knowing that they are part of a community where they belong, where they are accepted and understood—not simply tolerated. Each student has an advisor who knows the student well and often serves as an advocate for her/him. Through the advisory system, the school is organized to provide the close and continual guidance, monitoring, relentless nudging, and parental involvement necessary so that no student falls through the cracks. There are multiple opportunities for student voice, such as town halls, student council, and course and project choice. These experiences contribute to a culture in which students feel safe physically, intellectually, emotionally and socially and have ownership of their school and their learning. Students are respectful of their teachers and their school building because they are themselves treated as part of the solution, rather than the problem to be fixed. Their school discipline policies are designed to promote self-discipline, personal responsibility, and peer support and cooperation, not punishment and exclusion. Families are engaged as full partners in their children’s education, and their knowledge and expertise about their own child’s strengths, growth areas, and special skills and interests are sought out and valued. Students achieve mastery in core academic content areas and demonstrate proficiency on state and local assessments based on college and career standards. These high levels of student mastery are possible because their school’s instructional program is grounded in the belief that effort and persistence are critical determinants of school success. Instruction is not test-driven or remedial. Their school’s curriculum is inquiry-based and promotes deep understanding of major concepts, connections across content areas, and application of knowledge and skills to solve authentic problems. Students view learning as relevant to their lives and reflective of their passions, interests, and talents. Students graduate on time because the guidance counselor and teacher teams work together with a cohort of students all year to problem solve challenges, share best practices, and stay abreast of each student’s academic, social, and emotional wellbeing so that no student falls through the cracks. Adults build and maintain trusting relationships with students, which in turn are leveraged to increase achievement and provide a safety net of care and support. Students are prepared to enter and complete postsecondary education without the need for remedial courses because their school has set high expectations for them and put in place a variety of supports and safety nets to ensure that students can reach the high bar set for them. Writing and math labs, extended day tutoring, and academic mentoring help ensure that students have the foundational knowledge and skills necessary for higher- level learning. Community partnerships provide students with extended learning through after-school clubs, experiences, and opportunities for exploration and discovery about the larger world outside of their own neighborhood. Guidance counselors and advisors work with students and families to help them navigate the college application process from selection to acceptance. 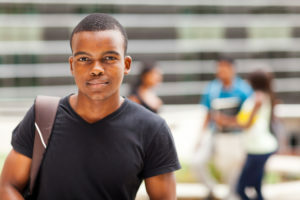 Visits to college campuses and participation in internships provide high school students with valuable exposure to the norms and expectations of the university context and the world of work.